In the foreground we have Xanthosoma sp. (coco yam or elephant ears). Across the lawn to the top right hand corner we see the tall grass miscanthus floridulus. The small plants in front of the miscanthus are a new (to me) variety of canna (Coccinea) which has to think long and hard about whether it really wants to be a part of this garden or not. Promoted as a 6 ft canna they achieved little over a foot in their first season. Although they are competing with an established Musa Sikkimensis to the left and the miscanthus to the rear, after the amount of rain this year, one expected more from them. 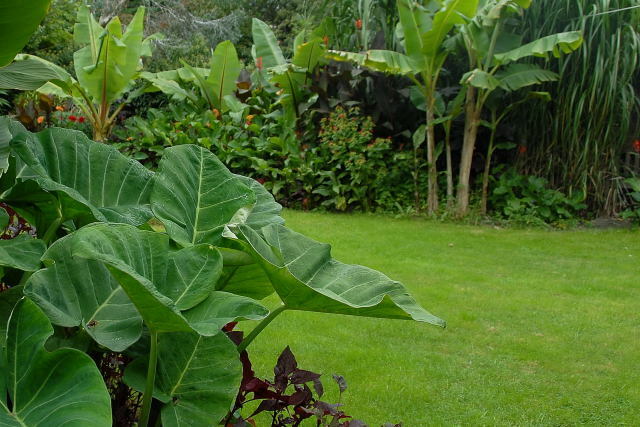 To the left of the Musa Sikkimensis the dark foliage is canna indica purpurea, their small orange flowers held quite high. In front of the purple canna, the four o'clock plant (Mirabilis jalapa). The Musa, purple canna, Mirabilis, miscanthus and the new canna will remain in the ground (with suitable protection) over winter. Hopefully this will allow the canna Coccinea to compete more favourably with its companions next year. To the leftare a trio of Ensete Ventricosum, two of which under performed this season mainly due to wind. As a result it is ta ta bella for them (compost heap) at the seasons close. They are planted amongst a mixture of canna Warscewiczii and dahlias. At the rear of this tropical border some miscanthus floridulus had been transplanted to give height but also failed to perform as expected. However next year it should provide a nice lax curtain at the rear of the border. Theoretically there should have been a tower of miscanthus either side of the central Ensete. This will be supplemented next season with canna Altensteinii.